This section provides an overview of what sitecore is, and why a developer might want to use it. It should also mention any large subjects within sitecore, and link out to the related topics. Since the Documentation for sitecore is new, you may need to create initial versions of those related topics. Download the .exe from http://dev.sitecore.net/ and double-click to start. This .exe will do everything for you - attach databases, modify host file, and set folder permissions. The only downside is that it leaves an entry in the registry under [HKEY_LOCAL_MACHINE\SOFTWARE\Sitecore CMS] and makes your instance available under ‘Add/Remove Programs’, which is misleading. Sitecore is just an ASP.NET application, not a Desktop application. You can choose to install and set up Sitecore manually by downloading the site root zip. You are responsible for attaching databases and ensuring that permissions are set up properly. You may wish to use this method in environments that require custom installation steps (databases are on another server, custom permissions needed). Follow the installation guide (available on http://dev.sitecore.net/; make sure you are reading the guide for your specific version) and - if you are installing on production - the Security Hardening Guide. Once you become a certified Sitecore developer, you will be able to download the latest version of Sitecore and all associated modules from http://dev.sitecore.net/. On dev.sitecore.net, there are always two different formats available for download - the complete site root or an executable file. 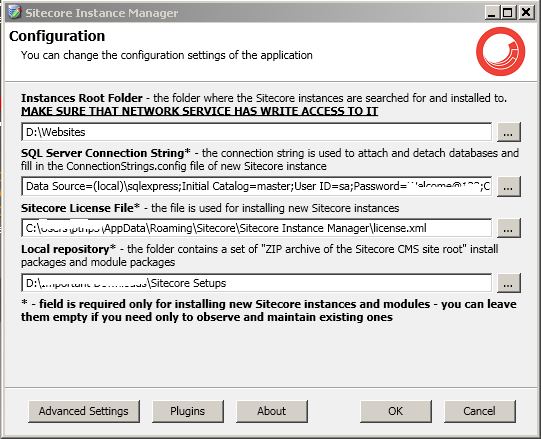 The following is a list of ways that you can install Sitecore. Website - Everything that will be accessible from the web browser. Open IIS and create a new website linking to the folder "Website"
At the Website folder properties, uncheck the “read only” checkbox. In Dev you can and give full permissions to the Application Pool user. In production you must follow the instructions contained (here), under item “4.2 Configuring Folder and Registry Permissions”. If your site is on localhost, point your browser to http://localhost/sitecore. If you see a login screen, you have successfully installed Sitecore. Sitecore Instance Manager is open-source tool which is used for managing the local park of Sitecore instances. You can install, locate, maintain, reinstal or delete Sitecore products. It also helps you install your sitecore instance with any sitecore packages, modules and only thing you need to do is set the folder for local repository where all the installations files are kept. See the below screenshot for settings. It also has API and plugin engine so you can extend it for any of your need.